The fast food chain is set to launch the service in a further 34 locations around the UK. 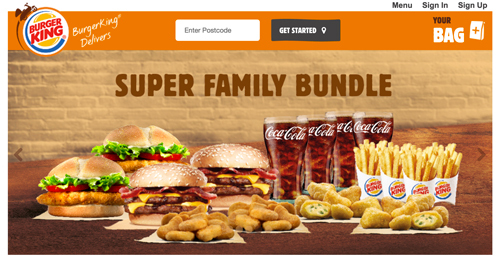 Burger King are rolling out their delivery service in the UK, and it could be coming to a town near you. The fast food chain previously trialled the feature in 8 areas around the UK, but have now rolled it out to a further 34 locations across the UK. Burger lovers can even visit their website and enter your postcode to see if they deliver in your area. Orders must be over £14 and delivery destinations must be within two miles of the restaurant. Meanwhile, where BK plans to deliver to our homes, MacDonald's is only looking to deliver to our tables, rolling out a table service in 400 UK restaurants by the end of the year. When it comes to home delivery it also seems the golden arches are keeping well out of it, because they want to produce food of the best quality. On their website they explain: We are committed to serving our customers hot food, fresh from the kitchen. We have previously considered introducing a home delivery service in the UK and have even trialled it in a number of locations. However, we found that a delivery service would not be able to adequately meet our quality commitment to serving hot, freshly prepared food every time to off-site locations. "We are therefore not in a position to support other delivery ventures in the UK as we could not guarantee this quality commitment to our customers."